I walked into the hotel suite and took in the beautiful interiors. The early morning sunrays lit the room, as if setting the tone for the day ahead. It was 8 am and I was on location at the Tribe Hotel in Nairobi for my photo shoot for True Love East Africa magazine. I was a little anxious, not so much because of the shoot, but because of the interview I’d done with the magazine and the fact that I felt I’d let out too much. The irony is that when I started this blog, I revealed a vulnerable side to me, my innermost fears and aspirations. I intend to continue on that path for as long as I have details on my life that I feel are important to share. But I’m in control of what I put out when I’m on this platform; I can’t control what will be published about me when it’s written by others. This has nothing to do with whether or not I trusted what the publication would write, it’s the mere fact that I prefer to tell my own story and that’s just how I’ll always feel. Regardless, being asked to appear on the cover of the one of the most read publications in East Africa humbled me, and it didn’t hurt that I would become the first ever expectant woman to be on their cover, a feat I will always wear with pride! I got seated, facing the window pane overlooking lush landscape that seemed to have no end in sight. The make-up artist had already begun working on me as we exchanged anecdotes about impending motherhood and all that comes with that journey. As we chatted away and the rest of the crew, stylist, producer and photographer began to fill the room with the usual energy and chatter synonymous with photo shoots, I began to think of how much my life had changed from the last time I’d featured on the cover of True Love back in the year 2009. It’s ironic that just like the current one, I was beginning a new chapter of my life back then, which was when I was moving countries and finding myself. I had been so young and unhinged, excited and… somewhat naïve. Six years later, as I prepare for the latest issue to be released, I’m a completely different person. Perhaps more cautious and weary. A lot more teachable as well, certainly making mistakes but learning from them! You won’t always get your way by asking for things YOUR way – Now, stay with me. It’s all about your approach. In the past, I would throw tantrums and inject a little sass in my tone when I wanted something to go my way, but I quickly learnt that this doesn’t only rub people the wrong way, it’s a sure way to burn bridges. I’m not saying that raising your voice or giving someone the blatant truth isn’t warranted at times, but try and calm yourself down, assess the situation, ask questions rather than assuming and be polite in your request. I’ve seen the difference it makes and I’m still trying very hard to work on this. Do you, people will hate you anyway – Ah, this lesson. When I was in South Africa, I learnt what it means to be discredited or disliked for simply being you. I was a young, black, foreign female living in Johannesburg and this irked different people in different ways. When I realized I wasn’t the problem, I began to embrace every part of me, my roots, my strengths, my weaknesses, my ambitions. Coming back home equipped with this new found knowledge is what continues to sustain me to date. At home, I may be disliked because of my tribe, my personality…sometimes people don’t like you because they simply don’t like you! That’s cool, it is what it is and it’s very much a part of life. Instead, focus on what’s important, on what you want to achieve. Silence the noise from your haters; they won’t pay your bills. Stay close to people that genuinely support you, sometimes you need a little help walking your journey. And don’t become bitter because of insults hurled against you from time to time; use those as weapons to fuel your fire, pray, stay grounded and keep learning from your mentors. Bottom line, do you, boo! Forgive yourself in order to forgive others – This one is tough and I must admit I’m still working on it! I’ve realized that when I’m finding it hard to forgive someone for something they’ve said or something they’ve done, I need to look into myself and try to understand why I’m unable to release that bad energy. Sometimes, somewhere deep inside of me, I’ll find that I’m allowing this person to have a hold on me that is toxic and adds no value to my life. I have to release that. Or sometimes it’s because I did something that provoked a negative reaction from someone and have to make peace with me before making peace with them. As much as there are times we find that some wrongdoings are just too hard to forgive, ultimately that is what sets us free. But it’s such a work in progress. It takes a lot of grace and calm to have these conversations with ourselves to finally get to that point where we say ‘I’ll let it go’. Oh, be sure to grab your copy of the September 2015 issue of True Love East Africa Magazine! your really an inspiration.Making the bolder move was the best. Thanks Janet,you such an inspiration! 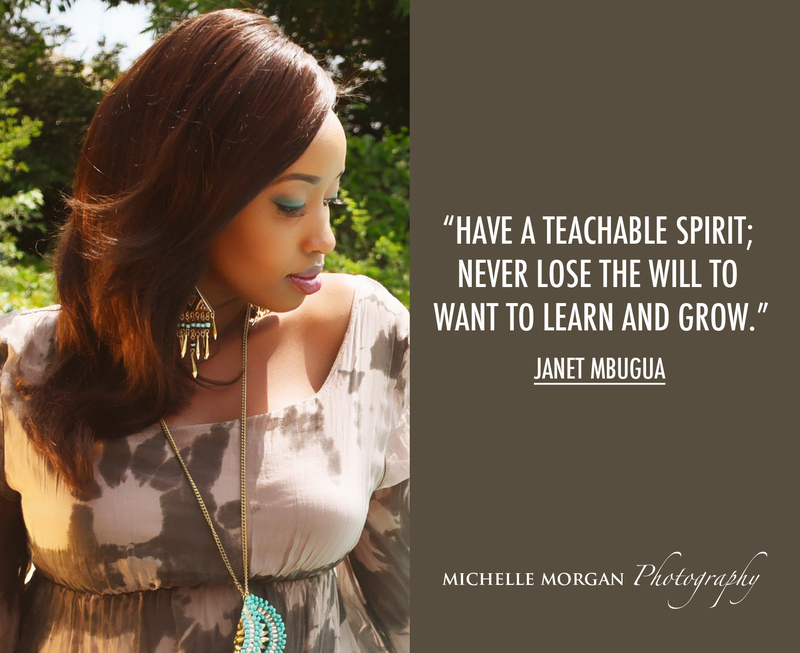 absolutely educative,l learn alot from your blogs dear janet.Though l don't know you in person , your blogs mentor my life and so l can simply call you my mentor.i always feel like am interacting with you and learning all l could from that lovely T.V. personality……..kwa kweli una inua dada. Really inspiring.You are a mentor to many.Keep it up and all the best. You are looking so glamarous Janet. ''Forgive yourself inorder to forgive others" this has to be one of the most difficult of them all,its something am working on too. Your radiating beautiful, you look amazing! Be very proud of your achievements. Woop!Woop!The pics are so beautiful..you are indeed so pretty.. Thank you dear! Hope you enjoy reading it! u r an inspiration…all the best wherever the journey leads you! Nice article Janet! I'll be sure to always do me!! !